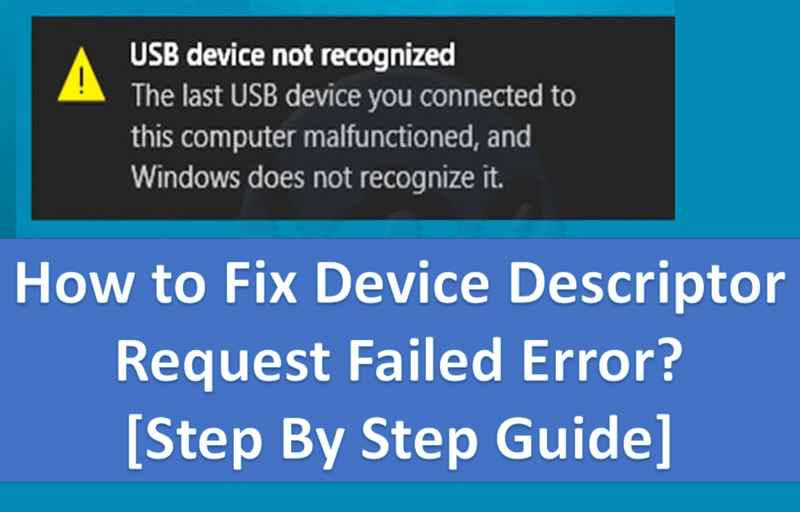 USB Device is not recognized or Device Descriptor Request Failed is one of the most common error that Windows users face. In this scenario, when a user inserts a USB drive to the USB Port it returns with an error. Even when you go to the Device Manager assuming that you can fix the issue by reinstalling the Windows driver. You get to notice the Unknown USB Device (Device Descriptor Request Failed) error. This error mainly appears because of outdated drivers. So the question is how to fix Device Descriptor Request Failed error? Well, thankfully there are a bunch of ways to get rid of it. To help you out, we have handpicked some of the top solutions for this error. So let’s just go ahead and check out those solutions. The methods that we are going to mention is a sequence process. Hence, as a result, follow the methods one by one unless you finally get rid of the error. Since the error sometimes can be very straightforward and it may not take much of effort to fix it. So start with the steps one by one. Step 1: If you are getting the device descriptor request failed error for the first time then shut down your PC and remove all the power supply. Step 2: Then wait for a couple of minutes and start the system again. This should fix the device descriptor request failed error. If it does not, then follow the next method. In case the above-mentioned steps did not work for you, then there is another solution which is disabling fast startup. Microsoft has integrated the Fast Startup option in Windows 10. Step 1: First of all click on the start menu. Step 2: Then go to the Control panel. Step 3: From here you have to open the Power Options. Step 4: Now from the left side go to the “Choose what power buttons do” option. Step 6: In the end, you have to uncheck the Turn On Fast Startup Option and you are done. Once you are done following all the steps save everything and restart your machine and check if you are getting the device descriptor request failed error or not. Step 1: First of all click on the battery icon from the taskbar. Step 2: Then you have to choose power options. Step 3: Change the plan settings. Step 5: After that, you have to find USB settings from the list and expand it. Step 6: Then you have to click on the USB selective suspend settings to expand it. Step 7: Now follow this path: battery options > Select Disabled. Step 8: Follow the same steps for the plugged in option > Apply > Click Ok.
That is it go ahead and check if it has helped you to fix the device descriptor request failed error or not. Step 1: First of press Win Key + R button to open Run dialog box. Step 2: Now over here you have to type down “devmgmt.msc” and hit the Enter button. Step 3: After that, you have to click on the Universal Serial Bus controllers and Expand it. Step 4: Now you have to connect your USB device to your Computer. Then from the universal serial bus controller list look for the unknown USB device (Port reset failed) option. Step 5: After that right click on it and select uninstall. Step 6: In the end, restart your machine and see if you are still getting the device descriptor request failed error or not. Step 1: First of all press Win Key + R button to open the Run dialog box. Step 2: Now you have to type down devmgmt.msc and hit the Enter button. Step 3: Then go to this following path: Universal Serial Bus controllers -> right click on Generic USB Hub option -> Update Driver Software option. Step 4: Then you have to select browse my computer and then click on the option that says Let me pick from a list of drivers on my computer. Step 5: Then you need to select the Generic USB hub and click on Next. Step 1: At first click on the start menu. Step 2: Now go to the control panel. Step 3: Look for the Troubleshooter option from the search bar. Step 4: Now go to the Hardware and Sound and select the configure a device option. Step 5: Then wait for a couple of seconds, once the troubleshooting process completed. It will display you all the errors and fix them one by one. That’s it. Now go ahead and check if it has solved the device descriptor request failed error or not. So those were all the steps that you have to follow to fix device descriptor request failed error. Now it’s your call to go ahead and try the steps one by one and see if it is working for you or not. Also in the end, if nothing works out for you then consider reinstalling Windows. Anyway, if you have any more questions to ask then do feel free to comment below.